Tavistock Farms is a community of Single Family and Townhomes located in the southeast quadrant of Leesburg, Virginia, 35 miles west of Washington, D.C. And 15 minutes from Dulles International Airport. We are fortunate to live in a community with great neighbors, right in the heart of Northern Virginia – horse & wine country. 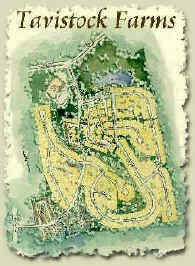 A short distance to the restaurants, a premium outlet mall as well as all the shops and events in historical Leesburg. Open spaces and convenience – Tavistock Farms is a great place to live! The area now known as Leesburg was first settled between 1725 and 1730. In 1742, the land of Lord Fairfax’s Fairfax Proprietary was designated Fairfax County then in 1757 Fairfax County was divided and the western portion was deeded to his nephew, John Campbell, Fourth Earl of Loudoun. Leesburg, founded in 1758, was named to honor the Lee family of Virginia. Belmont and Coton Hall in Loudoun and Sully, straddling the Fairfax/Loudoun county line, were Lee family estates. Two of the Lees of this era were signers of the Declaration of Independence. Leesburg and Loudoun County served as the seat of government of the United States for a brief period during the War of 1812 when the British burned Washington. President Madison was a guest of Ludwell Lee at Belmont and the documents of the United States, including the Declaration of Independence and the Constitution, were stored in a safe in the basement of Rokeby, near Leesburg. Today the Leesburg downtown Historic District is on the National Register of Historic Places and Leesburg is cited as one of the best preserved and picturesque downtown areas in Virginia. Tavistock Farms has been an active part of the Leesburg and Loudoun County economy since the early 1800’s. The Myers family owned and farmed the property for almost 100 years, from the 1850s until 1950. Beginning in 1950, the property changed hands several times and in December 1986 was sold to a developer, Tavistock Farms General Partnership. In May 1990, The Partnership subdivided the property and began development. After a brief time, both the developer and the funding bank went under and the property was taken over by the Resolution Trust Corporation. During the early 1990’s, the RTC divided the development and sold the information center property at the Sycolin Road entrance and several lots to both developers and individuals. In December, 1994, Arcadia Development purchased the property and resumed development. Today, all 305 single-family and 213 town home lots have been developed. The Somerset apartment complex and old sales center at either end of the community are independently owned and not part of our Association. By Marcee Judd And Earnest Gibson November 29, 2000 (PDF). Vision: We envision a community that offers an inspiring lifestyle and quality of life, and is a desirable place to live and enjoy the benefits of family, friends, and community. Mission: Our mission is to protect, preserve, and enhance the quality of life and sense of community through effective, efficient, and fiscally responsible management of the Association, enforcement of rules and covenants to strengthen property values, and support initiatives and improvements that benefit the community. Values: To achieve our vision and mission we value integrity, fairness, consistency, broad participation, diversity, respect, cooperation, and sense of community. Good Neighbors First. There is no better substitute for resolving community issues than being good neighbors. Property Maintenance. Property owners/residents will maintain their respective property in accordance with our covenants, conditions and restrictions that enhances the Association and does not detract from the value of our properties or common areas. Common Good. We will evaluate all issues on their merit to the Association, our Mission Vision and Values, and not with regard to any particular interest group. Volunteerism. We highly value participation in the Association that extends beyond the normal commitment(s) of being a member/resident. Questions or concerns regarding payment of your Association Fees can be made to our Corporate office at 1-800-336-8009, extension 1010. Property Management People, Inc. (“PMP”) is responsible for the maintenance and operations of the common areas of the Community under the direction of the Board of Directors. If you notice or have a problem, please contact PMP.